Here comes little Noddy in his little yellow car with his best friend Big Ears as a passenger. His other friends are Tessie Bear, Tubby Bear. The Wobbly Man and Mr Plod are also friends of Noddy and so is Gilbert Golly. Noddy stays in his little House For One. Noddy is a little wooden boy who lives in his own little House-for-One in Toyland. Noddy got his name because his head is on a spring and when he gets excited his head just can’t stop nodding! 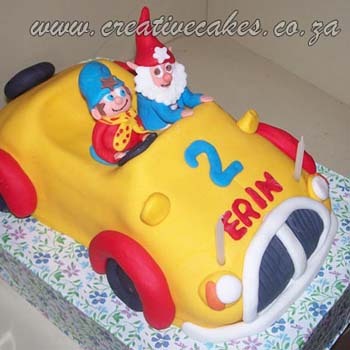 Noddy loves driving his friends around Toyland and delivering parcels in his little red and yellow taxi. You can hear him coming by the "Parp! Parp!" sound of his little taxi horn or by the jingle of the bell on his hat! Often he uses his airplane to get around to visit all the places in Toyland. Noddy is kind and honest, but he often gets into trouble, either through his own misunderstandings or because someone has played a trick on him, lie the naughty goblins Sly and Gobbo.